Last week's deal on Brexit withdrawal issues has been welcomed by the European Commission. The response was similar from leading members of the European Parliament, which gathers for its final plenary sitting of 2017 this week. On Wednesday, MEPs will vote on a draft motion which recommends European leaders should now agree to move to talks on transition and future relations. But their blessing comes with some remaining caveats - five to be precise, mainly on the issue of citizens' rights. A cross-group coalition wants all citizens' rights to be extended to "future partners" and any application processes to be cost-free. They also want British citizens living in EU countries to keep free movement rights after Brexit and for EU court decisions in this area to be binding. And they want further clarification that the commitments on avoiding a hard Irish border are "fully enforceable". MEPs have the power to veto any final deal - although that vote will only come towards the end of the exit process. The question for the moment is: will the negotiators be listening? The day begins with a debate on changes to the financial regulations governing the EU's common agricultural policy. The changes aim to simplify the payments procedure for young farmers and "greening" schemes, which introduce higher payments for sustainable farming. Later they will discuss a planned extension to a measure exempting flights from the EU's emissions trading system (ETS). Flights to and from the European Economic Area (EEA) have been temporarily excluded whilst international regulators draw up new emissions rules. Under a deal agreed in October, this exemption will now apply until 2023 - with a new reduction requirement applying from 2021, pending a review. In the evening they will debate an EU partnership agreement with Kazakhstan ahead of a ratification vote on Tuesday. 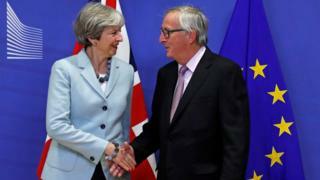 The agreement, parts of which have been provisionally in force since May last year, will replace a previous deal agreed in 1995. The deal is the first "enhanced" agreement the EU has concluded with a central Asian country, and increases co-operation on trade, energy and education. They will also discuss an advisory report from the international trade committee about the trade in digital goods. Among its recommendations is a suggestion that future EU trade deals should maintain the "right of a party to protect personal data and privacy". The sitting opens with a debate on the final report from the inquiry committee set up to investigate the Panama Papers leaks last year. A list of recommendations accompanying the report will be put to a final vote on Wednesday. It comes after the EU published its first-ever blacklist of 17 tax havens last week, along with a "grey list" including several countries with UK links. Some MEPs have criticised the fact that no EU countries themselves are listed as tax havens. At the voting session, they will vote on a motion objecting to an EU Commission proposal to authorise phosphate additives in frozen kebab meat. A resolution from the centre-left and Green groups says authorisation should be withheld pending the results of a scientific study due by the end of next year. Some MEPs have health concerns about the additives and a possible link to cardiovascular disease, although this is disputed. However, at least half of MEPs will need to back the motion to ask the European Commission to think again. In the afternoon there will be external relations debates on Afghanistan and the plight of Rohingya Muslims in Myanmar. They will also discuss EU security policy and PESCO - the bloc's new plan to boost defence co-operation. The evening will see debates on implementation of the Iran nuclear deal and Donald Trump's decision to recognise Jerusalem as Israel's capital. There will also be a debate on an urgent evacuation plan devised two weeks ago for migrants facing abuse in detention camps. The move follows the publication of video footage that appeared to show migrants from sub-Saharan Africa being sold in Libya as slaves. The debate on Brexit negotiations begins at 08.00 GMT, with European Commission Brexit negotiator Michel Barnier due to take part. The vote on MEPs' latest motion will come after 11.30 GMT - given it has backing from five political groups, it is almost certain to pass in its current form. Before the voting session gets underway at lunchtime, there will be a short ceremony to award this year's Sakharov human rights prize. This year's award will honour political prisoners and the democratic opposition in Venezuela. Among the votes will be a motion drafted by SNP MEP Alyn Smith accusing China of "constant interference" in Hong Kong. After the voting session, the afternoon sitting kicks off with a debate on whether Bulgaria, Romania and Croatia should join the passport-free Schengen travel area. The European Parliament has maintained since 2011 that Romania and Bulgaria are ready to join, but doing so would require unanimous agreement from EU states. Check-free borders within the Schengen zone have come under increasing pressure in recent years due to migration from Africa and the Middle East. They will also discuss plans to beef up the the EU's Brussels-based disaster response team. All 28 EU states are a part of the scheme, along with Iceland, Montenegro, Norway, Serbia, Macedonia and Turkey. Last month the European Commission announced plans for a revamped scheme, with a reserve of new civil protection capabilities managed by the EU. In the evening they will debate a motion from the civil liberties committee calling for more to be done to fight sexual abuse and exploitation of children. They will also discuss stalled plans to update the powers of European Parliament inquiry committees. The final day of the plenary sitting begins with a debate on a report from the petitions committee about petitions it received in 2016. A total of 1,569 petitions were submitted to the European Parliament in 2016, around a 9% increase on the year before. After this comes debate on a report from the transport committee with recommendations for reducing emissions reductions from the transport sector. The report says that transport is responsible for almost a quarter of Europe's greenhouse gas emissions. It calls on the EU Commission to encourage the use of low-emission technologies and says driverless cars could be an "important asset" in improving efficiency. The month's human rights motions focus on Vietnam, Cambodia and El Salvador, and will be voted on from 11.00 GMT.